1. Button Card - I'll be making this one for Vday this year! 7. I found this somewhere and thought it'd be awfully funny for a husband who's into Star Wars! 8. 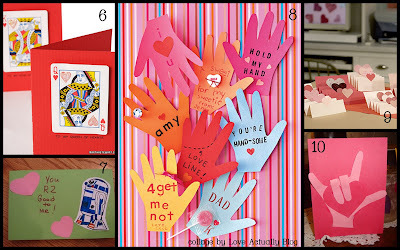 Hand Cards - how funny! I love these! "Handsome"...haha! 11. 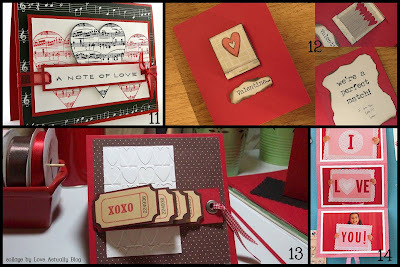 A Note of Love - Perfect for a music lover! 12. Perfect Match Card - this is probably my favorite of all! 13. Ticket Card - um...stinkin' cute! 14. Picture Card - exchange the cute little girl with you! I know there are so many more out there...but, there's always next year! I've been making cards for my hubby and each kid that comes along for 12 years now. I just can't go back to store bought. These are darling! I love the buttons too! CUTE!!!! omg. I must get the crafty urge and so some of this. Cute!! I am so pleased with my checks and spa package!! Thank you! I love the button hearts! Love these! I nominated you for a blog award on my blog www.mommyknow.blogspot.com. What cute cards! Thanks for the great ideas! wow, all of this is so cute !!!! I am totally making the button one. 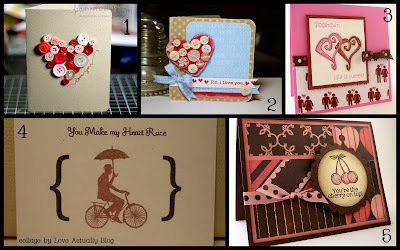 Now--where would I find cute candy bar wrappers, or hot cocoa wrappers for Valentines day? roses early for the prettiest petals.